Mix together flour, soda and salt and set aside. Cream together cookie butter and Crisco. Gradually add sugars. Add egg and vanilla. Blend in dry ingredients. Stir in Heath bits. Form into balls using a teaspoon of dough for each. Roll in granulated sugar and place on ungreased cookie sheets. Bake at 350° for 10-12 minutes. 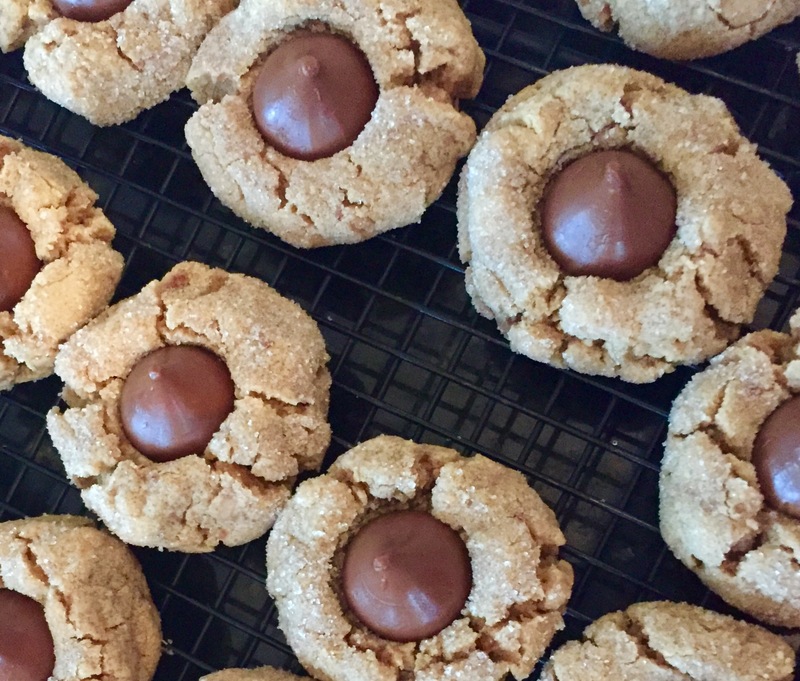 Immediately place a chocolate kiss on top of each cookie until it cracks around the edges. CAKE. That is all. No need to say anymore. It’s time to treat! Place all dry ingredients in a large mixing bowl and stir together with a wire whisk. Add the remaining ingredients and beat on medium speed for 2 minutes. Pour into parchment line pans, filling each pan a little over half full. Lightly tap cake pans on counter to bring air bubbles to top. Bake in preheated 325° F oven until cake test done. Allow cakes to completely cool. Frost each cake with homemade buttercream frosting. Stack cake and line the outside with vanilla filled wafer cookie sticks. We did it! Christmas 2018 was a huge success. Lots of family time, wonderful gifts, and yummy food especially all of the sugary things we wait all year to enjoy. And enjoy we did! So much so that we are swapping our normal Saturday indulgences with a healthier version of Oatmeal Peanut Butter Cookies. Don’t worry, we will back to baking our normal way soon. New Years Eve is just a few days away so we are saving up to ring in the new year in a very sweet way! Preheat oven to 350°F. Line a baking sheet with parchment paper.In a large bowl, whisk together dry ingredients (minus chocolate chips), set aside. Pour wet ingredients into dry ingredient bowl. Fold ingredients together until combined. Then fold in chocolate chips. Take VERY small handfuls of mixture roll into small balls (about 2 Tbsp). Flatten to baking sheet. Make about 20 cookies. Bake for 10-13 minutes, or until cookies are golden outside and soft inside.